A classic spun aluminum Moon oil tank specifically made for motorcycles. This 3 quart oil tank is 5" diameter and 10" long. 1/4" NPT fittings. A high-quality oil tank that will look beautiful nestled in the loins of your chopper. If this item shows as in stock, then it is on the shelf and ready to ship, no waiting! Made in the USA. Cast aluminum MOON oil tank mounting brackets are NOT included, please see related products below. This tank comes with a 1-5/16"-12 thread filler cap. There are a variety of custom style oil and gas tank caps sold separately, including brass, aluminum, and cast aluminum styles from brands such as Lowbrow Customs, Mooneyes and LC Fabrications. 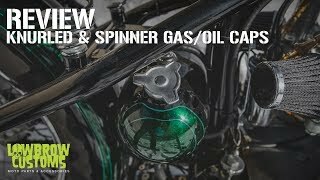 You can easily change up the style and look of your bike with a different filler cap. Please note that there are both vented and unvented caps, this oil tank comes with an unvented cap as it has a separate vent on top of the tank, though you could really use either style you like. My tank arrived in Australia about a week after ordering,prompt and undamaged perfect size for my build. Awesome work. Probably the best price with shipping, purchasing from a guaranteed good company. I bought some bulletproof mounts off of fab Kevin, came out sweet. Great quality tank with a badass look for an old school bobber!